I prefer ash for my own arrows but use Port Orford cedar for most of the arrows I make for other people. Cedar makes a light arrow that is fairly easy to keep straight. It makes a very good target arrow. The biggest problem with it is that it breaks a lot more easily than most other woods when you hit a tree or rock. Ash can take more of a beating but can be a little harder to get straight and keep that way. A lot of people say that ash will fly better from a non-center shot selfbow since it is a lot heavier than cedar. I like to shoot hunting weight arrows year round, and ash is the better choice for good penetration. I like to use natural stains for all my arrows. I use black walnut or wild cherry almost exclusively. I do not crest or crown dip arrows. I do, however, occasionally stain arrows in a fashion that makes them appear to be crown dipped. 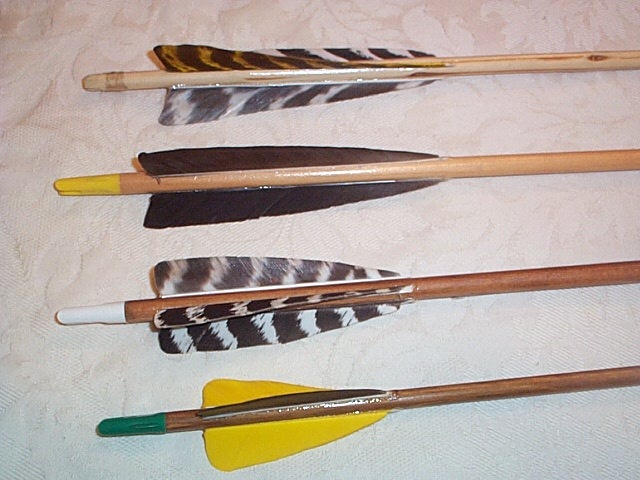 I use wild turkey fletching for most of my arrows but can use the dyed domestic turkey fletching for those who want it. All arrows come cut to length with field tips attached. I can leave them un-tapered and full length if desired. State your desired length, back of point to string groove (draw length). 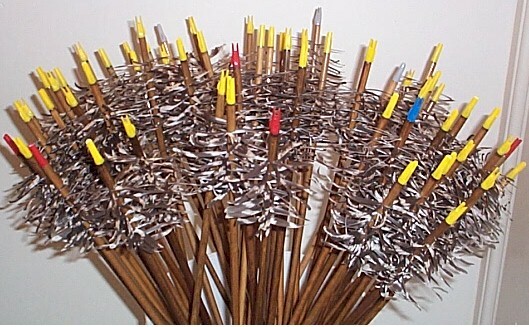 Fletching varieties: 3", 4", 5", 3-fletch, 4-fletch. The top arrow has a self nock. I prefer to use spiral fletching for my flu-flus when they are to be used on aerial targets or for close shots in hunting. This fletching causes the arrow to go less distance than one with helical fletching. I prefer to use 4-fletch 51/2" feathers for flu-flus when I need to make a longer shot. I can use cedar or ash for either style. Spirally-fletched flu-flus, $45 per half dozen. Please specify the draw length, spine, and stain preferred.